We’re going to use two different techniques to color metal with alcohol ink. Now, here in Part 2 of this tutorial, we’re going to use alcohol inks to color these pendant blanks with different techniques. Metal you’d like to color with alcohol ink. Here I’m using the 2 yellow brass pendant blanks we made in Part 1 of this tutorial. I’m using 3 colors of Ranger Adirondack alcohol ink – Watermelon, Sail Boat Blue, and Citrus (they were sold together in a 3-pack at my local craft store). Cotton swabs (Q-Tips) for “painting” with the ink. Small piece of paper towel soaked in rubbing alcohol for quick cleanups of your fingers, or to remove the ink from your metal if you want to re-do it. Work surface that you don’t mind getting stained. Wear clothes that you don’t mind getting stained. Well-ventilated area to work in – the alcohol ink fumes can be strong. Start with clean metal, to remove all traces of skin oils and anything else that may resist or affect the ink. After washing off all of the dish soap, sprinkle a small amount of baking soda onto both sides of your metal and scrub it well. Alcohol ink can be messy, and can also leave stains on things you didn’t mean to color. I used a washable black plastic jewelry tray, lined with a paper towel, and put everything I was going to use inside this tray. Then I did both of the inking projects right inside the tray. If possible, do a test of your inks on a scrap of metal that’s similar to the piece you’ll be using. That way you can see what the colors look like on it, and experiment with some different ink designs and techniques before putting any ink on your final metal pieces. 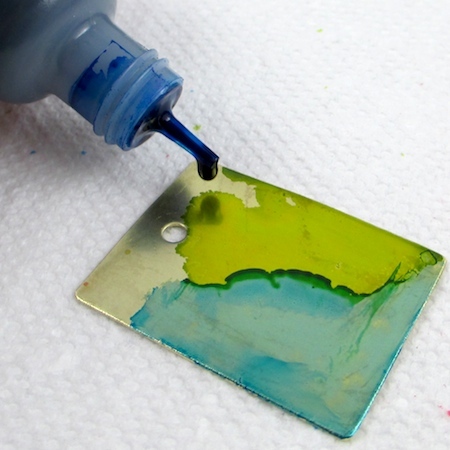 Choose a color of alcohol ink, and drip one drop of ink onto your metal. Let your colored metal pieces dry completely before handling them (I let them dry overnight just to be sure I won’t mess up the color). Tip: With this free-form technique, use restraint in how many drops of ink you use – especially if you’re coloring something fairly small like this 30mm x 40mm metal pendant blank. The naturally spreading ink will create wonderful designs for you! Tip: Try this technique with two ink colors – a darker color to fill the texture pits and wipe off the top, and then a lighter color to cover and leave on the entire piece. Put the inked metal pieces someplace safe to dry thoroughly, and put everything else away. Wipe out the jewelry tray with a damp or soapy cloth. Although I have not sealed my finished metal pieces after inking, many people do. Colored Metal into a Riveted Pendant? I’m SOOOO excited about trying this!!!! I love working with metal, so I can’t wait to see the designs that come out of the ink & metals. Love the colors you used on the top piece, lol they are so retro, which of course is all the rage. Question- have you tried using a tiny paint brush to do more controlled designs or is this technique better with free form? Thanks again Rena!!! Awesome! I love the look of colored metals and haven’t tried alcohol inks. You’ve inspired me to give it a try! Just checking to see if you can make homemade ink. I think I saw it in one of my searches on the internet. Always looking for a way not to use a lot of money on things I’m just trying out and don’t know if I would like to do more. I think all of your newsletters are the best that I read and keep all of them for future reference. Thanks for the great tutorial – there’s always something new to learn, which is what I love about metalsmithing. I’ve been meaning to bust into my torch-fired enamels to add color, but ink sounds like much more fun. Does the finished product (sealed) stand up to wear and tear, or should it be confined to pendants? Where do you get the textured metal blanks? Thanks! Hi Judi! Thanks for asking. I actually made my own metal blanks from brass sheet and textured the larger one using the sharp end of one of my hammers – you can see how I did it in this tutorial: Easy Riveted Pendant Tutorial. It’s actually quite easy and gives you more creative control over the size and shape of your pendant blanks! Alternatively, you could purchase pre-made pendant blanks and do your own texturing on them with a hammer or other tool. This is a really pretty technique. I absolutely need to give this a try. Thanks for sharing! Gretchen, I love the bright watercolor like technique, thanks for sharing a tutorial, pinning for later! Love the color combination! It came out really nice! I’m looking forward to trying this. I love the results. I have a son who enjoys metal art–he will be excited to learn from this post as well. Thanks for sharing! Gorgeous! I really want to give this a try! Really beautiful, thank you for the great tutorial! You make such complete and understandable, doable tutorials. Your jewelry is exquisite, you are so talented. It’s wonderful of you to share this knowledge with us. I can’t do this due to problems with my hands but would be excellent for my husband to do. He’s very good at things like this and would be therapeutic for him. He had a stroke in 2010 so his majority hand gives him some trouble. His dr. told me to try to have him do something to keep his mind engaged and his hands. He’s lucky as he didn’t lose use of his hand but does have some loss of strength and dexterity. Your projects would be so excellent for him. He likes to make things but gets somewhat frustrated at times. I’ve saved both parts 1&2 so he can see what you do. Thanks for sharing your time and talents. Happy weekend. I ditto everything you said about Rena’s tutorials…..they are the best I’ve ever come across. So sorry to hear of your husbands stroke. My Mom had two and yes it is important to keep them occupied. It will be frustrating for both of you but please stick with it. Mom was very talented and crafty before the second stroke, after the second one she lost a lot of dexterity. Try some water color painting, even if he has to use his fingers. The alcohol ink is easy to do and really engages the mind. He would have to hold the little bottle, but that might be good for the dexterity. Hope I didn’t come off as a know it all or to nosey. I just wanted to share. Good luck to your husband and his recovery!! This is beautiful. I love the way the colors work together. I had no clue you could do this. Thank you for sharing! What a fun and interesting process! Thanks for sharing the great tutorial. I will need to give this a try and incorporate it into a future craft project I am planning. Thank you for sharing your beautiful tutorial! The pendants look so pretty! Can you use silver instead of brass and copper with these inks? Would a pendant hold up to wear and handling without a protective coating and if so, which one would you use? Thanks for this great idea! I LOVE this post!!!! I am really interested in jewelry making and this tutorial is great! I will be signing up for your newsletter! I’ve never heard of alcohol ink before. This sounds like so much fun! I love how pretty the colors turned out and the neat designs it makes! Thanks for the information, Rena. I’ve had several bottles of alcohol ink for who knows how long and have never used them. You have inspired me to get them out and go to work! The colors and the design on the smaller blank remind me of a water color technique I’ve often used. It is time to put this past experience to work with a new medium! Nancy, as inventive as you are, you will have a ball with alcohol inks! 🙂 I can’t wait to see what you do with them! I am still in love with alcohol inks, but I was having a problem with them flaking off after awhile, even after I sprayed them with a glaze. I did a little research and found out that it’s helpful if you heat set the ink on the metal. All you have to do is use a heat gun or maybe a hairdryer to heat it up. It seemed to make the colors even a little richer. I’ve heat set 3 pieces so far, but haven’t worn them to know if it makes much of a difference. Good luck! Does this work on copper? i would highly recommend PYM II to seal the alcohol inks to the metal. The finger pump spray works great for small projects. Love what you did with the inks. I am trying it now but my inks are pooling and am only using one drop. Tried using the Qtip but removed too much ink. What am I doing wrong? Hi Ruth, I think it’s just a matter of playing with the inks to see how they work, and seeing what kinds of effects you can create with them. When the ink pools, it usually makes a deeper color on the finished piece. That can be a really nice effect. Or tilt the metal so that the pooled ink travels around in an interesting pattern. If the Q-tip removes too much ink, try using a toothpick as your “paintbrush” instead. Or simply add more ink to the area where you removed too much color, and see what you can do with it. Especially when you’re first using alcohol inks, it helps to just go with the flow and let designs happen, rather than have a pre-conceived design in mind and trying to create that. Also, it’s a good idea to practice with your inks on metal scraps as I did, so you can get a feel for how your ink will behave. Hi Evie, I have not experimented with alcohol inks on aluminum. Could you tilt the aluminum blanks around to help the ink spread around a bit more? Another possibility is that you may need to rough-up the surface of your aluminum with some sort of texturing or even with sandpaper, so the ink has something to “grab” onto. You may want to experiment with that on a scrap of your aluminum that you don’t mind sacrificing if it doesn’t turn out well. Also, did you try using a Q-tip or paint brush to swirl the alcohol ink around on your metal? I have mainly used alcohol inks on brass and copper. I would think that water based sealer would come off when used for necklaces and such. How about liquitex sealer? First do a test run on a small scrap or sample of your component (in this case, on a scrap of the type of metal you’ll be inking). Then you can see how the technique will (or won’t) work on the sample, without ruining your actual piece. Another benefit of doing the test run on a scrap first – you’ll probably discover some things about the technique that will help you get better results when you do the technique on your actual component! If you experiment with the Liquitex sealer, please let us know how it turns out! I use acrylic glazing medium to thin the inks as it gives me time to work into the nooks and crannies of the porous materials I use, before the ink becomes too dry to wipe off, thus becoming blotchy. It also simultaneously seals the inks. (I make mini paper mache mask pins, (and full size masks), jewelry from shells and other found objects at the beach; and Metals.) With inks on metal jewelry, I’ve used Ren. Wax as a temporary sealant before but worry about how quickly it wears off with use; so, will have to investigate glazing medium on the metal too. Someone mentioned fingernail polish, I’ve done that too. Here’s the catch, I’m pretty sure anything layered on a metal surface unless it’s torch or kiln fired enamel, would probably, eventually wear off. Just conjecture. But what about the ultraviolet lights people put their nails under while drying? Perhaps a little time under a light source would help the polish or glazing medium seal into the metal just a wee bit longer? We need a chemist. Best of luck to all explorers. Please don’t take the Ranger alcohol inks, they are not stable on light! Reds, pinks and yellow disappear ! PInata are better because they have more pigments. I like working in copper and finishing my metal work with resin. Has anyone tried resin over alcohol inks? Hi Jo-Anne, thanks for asking. I think various brands of alcohol inks and alcohol ink markers may behave in different ways with resin. I would do a test run on a small scrap or sample of your component (in this case, using the ink on a scrap of copper and finishing it with the resin). Then you can see how the materials and technique will (or won’t) work on the sample, without ruining your actual piece. Another benefit of doing the test run on a scrap first – you’ll probably discover some things about the technique that will help you get better results when you do the technique on your actual component! If you do experiment with the alcohol inks and resin, please let us know how it turns out! Using Soft Flex Beading Wire Without Crimp Beads? How to Take Apart the Links in This Chain?